Cast in high relief with flying peasants, dragonflies, butterflies amidst scrolling grapevine in the outer circular border. The central boss knob in the shape of a crouching lion encircled by two regal peacocks and four lively lions prancing amid more grapevine. 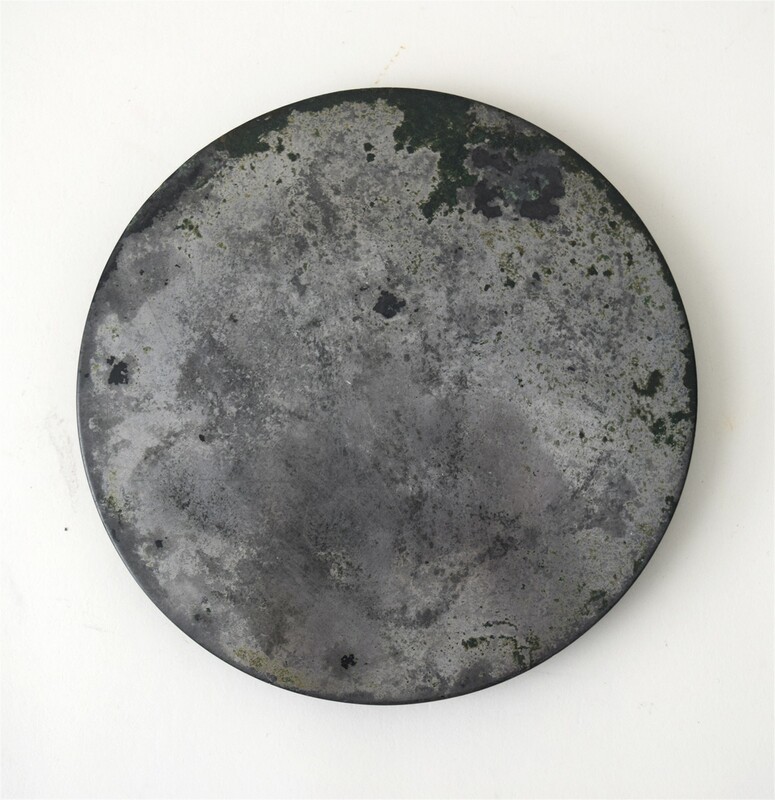 The majority of early Chinese bronze mirrors are dated from the Han dynasty (206 BC – AD 220) or Tang dynasty (618-907). 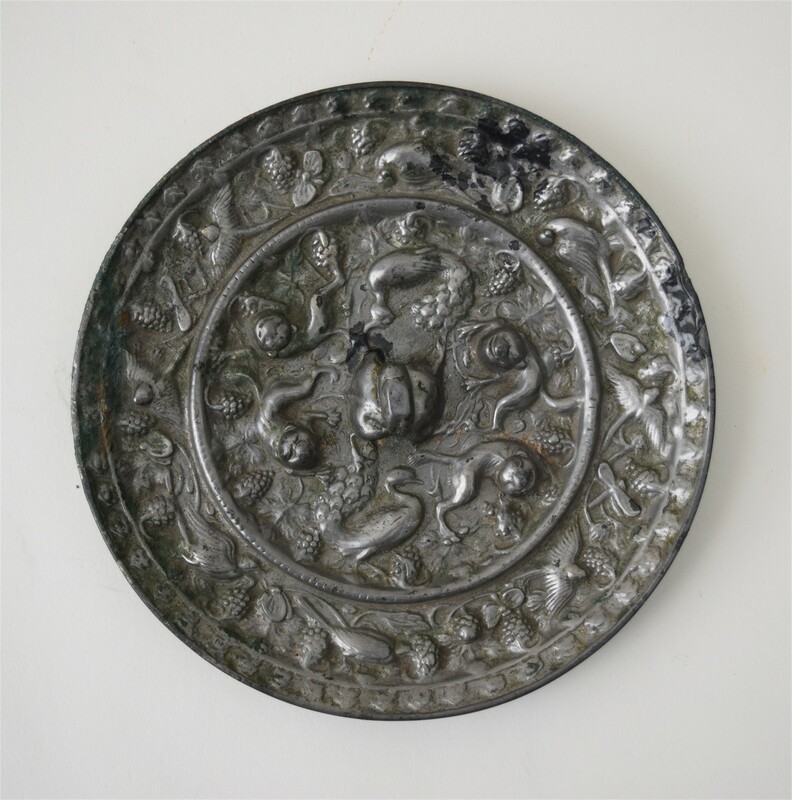 Throughout Chinese history, ancient bronzes were mostly lost or destroyed during violent social and political upheavals, thus making bronze mirrors that are smaller and not typically part of rituals an unique subset. Tang rulers highly treasured silverware because of the rarity and beauty of silver, and thus commissioned the creation of numerous elaborate and exclusive pieces that showcase the craftsmanship of Tang artisans. Silver articles remained solely owned by the most wealthy: the royal family, the nobility and temple guardians. The decoration of these mirrors in the Tang were influenced by the Western merchants travelling along the Silk Road, with Sute shaps and decorations like a honey suckle pattern, flowers and birds. In the late Tang era, due to a backlack against Buddhism, the shape and design of silverware adopted entirely Chinese characteristics: common designs were birds in flight, lions and grapevines. Similar example in the Palace Museum, Beijing.